ComingSoon.net is bringing you a special Halloween edition of our premium unboxing video series CS Unboxed, featuring Universal Monsters movies and Halloween Superbuckets from Super7! Check out the video below to see our Halloween Haul! Click here to purchase the Super7 Universal Monsters Superbuckets! Every day is Halloween at Super7 with the Frankenstein and Creature from the Black Lagoon Superbuckets! An officially licensed retro plastic bucket for trick or treaters of all ages, they retail for $20 each. 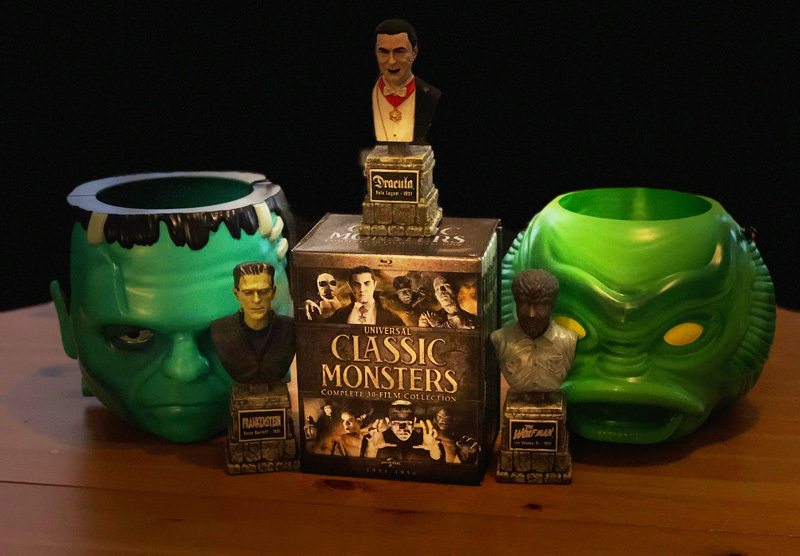 Click here to purchase the Universal Classic Monsters box set! Thirty of the most iconic cinematic masterpieces starring the most famous monsters of horror movie history come together on Blu-ray for the first time ever in the Universal Classic Monsters: Complete 30-Film Collection from Universal Pictures Home Entertainment. Featuring unforgettable make-up, ground-breaking special effects and outstanding performances, the Universal Classic Monsters: Complete 30-Film Collection includes all Universal Pictures’ legendary monsters from the studio that pioneered the horror genre with imaginative and technically groundbreaking tales of terror in unforgettable films from the 1930s to late-1950s. The Universal Classic Monsters: Complete 30-Film Collection includes: Dracula (1931), Frankenstein (1931), The Mummy (1932), The Invisible Man (1933), The Bride of Frankenstein (1935), Werewolf of London (1935), Dracula’s Daughter (1936), Son of Frankenstein (1939), The Invisible Man Returns (1940), The Invisible Woman (1940), The Mummy’s Hand (1940), The Wolf Man (1941), The Ghost of Frankenstein (1942), The Mummy’s Ghost (1942), The Mummy’s Tomb (1942), Invisible Agent (1942), Phantom of the Opera (1943), Frankenstein Meets the Wolf Man (1943), Son of Dracula (1943), House of Frankenstein (1944), The Mummy’s Curse (1944), The Invisible Man’s Revenge (1944), House of Dracula (1945), She-Wolf of London (1946), Abbott and Costello Meet Frankenstein (1948), Abbott and Costello Meet the Invisible Man (1951), Creature from the Black Lagoon (1954, and includes a 3D version), Abbott and Costello Meet the Mummy (1955), Revenge of the Creature (1955 and includes a 3D version) and The Creature Walks Among Us (1956). Which of these products will you get your hands on for the post-Halloween season? Let us know in the comments below!